This piece will not show the logos of MLB teams, nor their team names, only the cities. Okay, not really, as I am not sponsored by Upper Deck (as Bernal might be). Whatever might I be referring to? For my birthday (last week), I got baseball cards. Since I was about 8 years old, when asked what I wanted for my birthday, I have always said “Baseball Cards”. And I have usually gotten them. Even when I get some, I always buy some for myself. With all the different brands and levels of cards, I prefer to stay traditional and go with the standard Topps series. It is being produced in Series I and II again these days, and is still my favorite. Nonetheless, ever since 1981 when Donruss and Fleer put cards out, I collected those sets, when Topps lost their monopoly on baseball cards. You don’t have to know much about the baseball card industry to know that that was the beginning of the end. Donruss, Fleer, then Score and Upper Deck, as well as Topps, dumped untold millions of cards into the market, making them less and less “something”. You can get cases of cards from the late 1980s for $5. Not packs or boxes. CASES. Soon there were all different levels of cards - refractor, chase cards and so on. Boringly, I have always plodded forth with Topps regular sets, hand-collated, of course. Hand-collated means opening lots of packs and lots of doubles, but the opening of a pack and seeing what quality a pack has still brings a smile to my face, like Anton Ego warmly eating his childhood comfort food. This year was different. My mother still gives me baseball cards. She always worries that she will get me “the wrong kind”, and I always assure her there are no wrong kinds - they are baseball cards. I opened my gift from her and it was five packs of 2010 Topps Series I, 2010 Upper Deck Series I, and eight dealer bundled packs. The eight dealer packs, varying from fifteen to forty cards, were apparently ALL Atlanta Braves cards. The first pack I flipped through was seventeen different Andruw Jones cards. I was starting to think Sam H. put her up to this. Next was a pack with fifteen Tom Glavine cards and ten Kevin Millwood cards - all with the Braves. Chuckling yet? How about forty Andres Galarraga cards? Thankfully, there were some Rockies cards and two Expos (Upper Deck 91, 92) cards. Then another dozen Andruw Jones cards. Variety then picked up - fifteen Javy Lopez and fifteen Chipper Jones. Oooh, another pitcher collection - thirteen Greg Maddux cards and seven John Rocker cards! Another Galarraga pack, but this just has twelve Big Cat cards and then a dozen Walt Weiss cards - again, with a few Rockies cards. The last pack starts good, as the cover card is Brian Jordan. Amazingly, the entire pack is Brian Jordan, and for good measure a handful are when he was with the Cardinals. Mom, I apologize. When I said there were no wrong kinds of baseball cards - you proved me wrong. These were the wrong kinds. And I just got 185 of them. I still haven’t gotten to the point, have I? I moved past that to open the Topps cards. In one pack I got Mickey Mantle (card number 7, of course), and a “Tales of the Game” of “The Flip”. Now that was a nice pack. I got the Yankees and Dodgers Franchise history cards, and a replica ‘51 Blue Back of Honus Wagner (that goes for a double!). Mom was disappointed there was no gum in the packs. Nothing else too exciting, but replicas of the 1965 Juan Marichal and 1966 Jim Palmer. I moved on to the Upper Deck cards. It may not be readily apparent to many people, but it immediately struck me as odd. In every photo, the team name was obscured. Pitchers’ photos were usually from the back. The catchers had on a chest protector. The fielder or hitter had his arm across his chest. Generally, the hat emblem wasn’t clear. Maybe that’s just the photos they got. Maybe. Then I look at the “team”. Joe Mauer - Minnesota. Jayson Werth - Philadelphia, D.J. Carrasco - Chicago. Nowhere on the back does it mention the team. Not once does it say Twins, Phillies or WhiteSox/Cubs. He plays for the White Sox, FYI. After a bit more looking, I did see a couple of references to team names ([Ricky] “Romero shut down the Rays on 7/1/09”). That’s when I saw it. Down at the bottom of the cards, each of them, is printed “NOT authorized by Major League Baseball or its Member Teams”. There is no MLB logo on the cards. There is a Players Association logo. It is quite strange to look at cards and see, well, not what I expect to see. I am sure I read about it six months ago, but seeing it on glossy white card stock really brought it home. Hmm, no chase cards in the Upper Deck packs either. I really enjoyed reading this. I used to be an avid baseball card/memorabilia collector but bowed out of the game a few years ago. Reading this article, I felt like I was looking over your shoulder while you were opening cards. Cool stuff. Brought to you by the same marketing geniuses who've given us 300 tiers of ticket prices. I'm glad I stopped collecting baseball cards when I was twelve. There are two kinds of collectors, the serendipitists, like Chris and my wife and me, and completists, who want to check off every last box on the check list. In my hey day, I was both--I wanted to open the packs one at time, and slowly. And I wanted to accumulate the entire sets. I agree that 1981 was the beginning of the end, and it was largely the gimmicky stuff that did it in. At its peak, baseball cards were a great companion for learning and following the game. Topps put out a deep set--25 guys per team or so--allowing you to learn about all the utility infielders and 10th pitchers. I kept my cards arranged by team--when a trade happened, I shifted the cards accordingly. (I started doing this when I was 7 or 8 years old.) Virtually everything card companies did after 1980 went away from that model, toward prospects and rookie cards and nostalgia cards and chase cards and multiple cards of the same player. Today I confine myself to a handful of random packs per year, as they catch my eye in the store. That, and set building pre-1980. I have 1966-71 complete, and am going both forward and backward from there. I wish I could collect these cards by buying packs and opening them slowly, but I can not. Don't get me wrong. I complete sets...All of them since 1973, less one or two cards. I started buying my son complete Topps sets each year. He's just two, so needless to say I have more fun with it than he does. One day he'll thank me. One day he'll thank me for the cardhouse material. Seriously, I had a bazillion old cards I used for this purpose when I was 8 years old or so. Worked great. Yeah, this is what I imagine will happen. I'm putting all the rookies and future HoFers in binders. With the rest, he could do as he likes. I guess I'm too impatient...getting all those Andruw and Rocker cards would have had me immediately calling my Mom to change the "order" to ties and flannel boxers. Although, now that I think about it..the Rocker cards would make excellent sarcastic re-gifts. any Brian Jordan football cards thrown in the mix? thinking about it for just two seconds, you have to be impressed that he was able to excel in two professional sports. ONe primate, TheOtherHarris, is a huge Braves fan. She will most likely be the benefactor of the Glavine and Chipper cards. Just wait until Christmas, beetches. I truly wish I'd thought to put your mom up to that. Where can you get a case of cards from the late 80s for $5? I might be interested in that; just for the entertainment of cracking open a case of packs. Just crack into one of those fabled mother's basements you've always read about, and ask the landlady. She'd probably pay you five bucks just to haul them away. 1989 Topps or Score might be the cheapest you can find. The shipping might be more than the case on eBay. I was looking there, they wanted like 10 bucks a box. How big is a case? How many packs of cards would be in one? If I remember right from back in the day, they are 20 boxes to a case at 36 packs a case. Total would be 720 packs of cards, 15 cards a pack is 10,800 cards. 720 pieces of gum. If it was 5 bucks plus shipping for a total of 20 bucks or so I'd pick up a case or 88,89,90,91 Topps just for the hell of it. "and a “Tales of the Game” of “The Flip”." I'll trade you whatever you want for it. I could go for a cathartic burning of that one. I have no idea if this is true or not, but a friend of mine who currently owns a card shop said that if you open a pack very carefully, you can get all of the cards out, look at them, put them back in, and seal them up with 99.99 percent of the people not being able to tell that you did it. So some shop owners would open every pack, take out all of the valuable cards, replace them with worthless cards from other packs, and seal them back up. So be careful of "unopened" packs. This is possible with the old wax packs. Is it possible with the mylar kind that you have to rip open? 1989 Topps or Score might be the cheapest you can find. Donruss and Fleer, too. Upper Decks have the Griffey. Donruss and Fleer do as well but they were so mass-produced that you should be able to get a box for < $20, including shipping. If there is actually a card shop left in your area, they would probably have plenty of boxes that they would be all too happy to get rid of for $5 or so. Opening a box of cards can be a lot of fun and give you a cheap rush. But I bought so damn many in that era that I'm already familiar with all the cards in each set and am sick of looking at them. When I buy a box of the newer stuff, I get buyer's remorse, so usually when I get the urge to buy baseball cards, I spend the $20 or so on ebay getting the rookie cards of guys like Dave Winfield and Ozzie Smith, which I could never afford on my meager 10 year-olds allowance. The old wax packs you could for sure crack them open if you were careful and pull out the "good" ones and then seal them back up. 1988 Score was the 1st ones I think you couldn't do this with. Ah, maybe my friend was telling a story about the old days and not current packs. I don't pay that much attention to him. But if you get cases of packs from the 80's over the Internet, you never know. The late 80's and early 90's cards are worthless anyways. I don't think anyone would actually spend the time opening and resealing these packs. The best card is maybe 5 bucks if I remember right. I moved on to the Upper Deck cards. It may not be readily apparent to many people, but it immediately struck me as odd. In every photo, the team name was obscured. Pitchers’ photos were usually from the back. The catchers had on a chest protector. The fielder or hitter had his arm across his chest. Generally, the hat emblem wasn’t clear. Maybe that’s just the photos they got. Maybe. Then I look at the “team”. Joe Mauer - Minnesota. Jayson Werth - Philadelphia, D.J. Carrasco - Chicago. Nowhere on the back does it mention the team. Not once does it say Twins, Phillies or WhiteSox/Cubs. He plays for the White Sox, FYI. After a bit more looking, I did see a couple of references to team names ([Ricky] “Romero shut down the Rays on 7/1/09"). The Upper Deck strategy in the face of MLB's exclusive with Topps is interesting, to say the least. It is obvious that Upper Deck carefully and purposefully selected most of these "action" photos taken in profile or from the back to obscure or hide most of the logos and team names. Only the player is in focus; the backgrounds are all out of focus. They even added a little headshot of the player on the front of each card next to his name, position and team city because very few cards seem to show a front view of the player or his face clearly. It seems though that some cards still show enough of the logos on hats and jerseys to embolden MLB to sue Upper Deck. Donruss has the same kind of deal. They can't issue baseball cards with team logos like they used to so they're putting a lot of focus on college players. I think they issued the first cards of Matt Weiters and Buster Posey. But Topps has this thing where they put a "Rookie Card" logo and declare it the once-and-for-all Rookie Card of that player. It's already flawed, as they've declared that Josh Hamilton's 2007 issues are his Rookie Card while completely ignoring that he was already included in the 1999 Update set back when he was a hotshot prospect. Time will tell whether the market treats the Donruss cards of Matt Weiters as his rookie card, in terms of value. Personally, I hope it does, as Topps and Beckett's attempting to control the market is a big reason why the hobby isn't what it once was. They don't get to decide what a rookie card is; we do. If you can't pull a 1989 Topps Gregg Jeffries, I'll just freaking give you one. as they've declared that Josh Hamilton's 2007 issues are his Rookie Card while completely ignoring that he was already included in the 1999 Update set back when he was a hotshot prospect. I think they have always had this problem, going back to the 1980s when they really did updates all the time. I spend the $20 or so on ebay getting the rookie cards of guys like Dave Winfield and Ozzie Smith, which I could never afford on my meager 10 year-olds allowance. I just bought an '88 Donruss Gregg Jefferies rookie and the Billy Ripken fruckface card. "Where can you get a case of cards from the late 80s for $5? I might be interested in that; just for the entertainment of cracking open a case of packs." i actually donated complete sets of these late 80s/ early 90s things a few years ago to a local church store in Chapel Hill, and had the reciept used for tax purposes. i collected from around 1968-1976, and i should never have gotten back into it for those two or three years in the mid-90s. although, that said, opening packs did bring joy; just should have left the box sets on the shelf. I remember getting a pack of cards in Post Cereal when I was a kid, and wondering why Don Mattingly was wearing a generic black ball cap instead of his Yankee cap. I don't know if they were able to "photoshop" logos out or they just asked those players to pose in generic unis or what. The best trade I ever made was with my best friend who gave me a huge box of baseball cards on for a big pack of football cards I had received as a birthday present. He was a huge football fan and thought football cards were the wave of the future. He had inherited the baseball cards from an older cousin and they had some awesome vintage 70s stuff - Ozzie Smith rookie, early Jim Rice card, Steve Garvey, Nolan Ryan. I think the best player I gave him was Reggie White. Football card companies loved to stack the deck with kickers. I remember those cards - they airbrushed the photos to remove the logos. Yeah but no card company ever said THIS is the player's rookie card, which is what Topps has been doing. The market decided which card was the "true" rookie card and therefore more expensive/desirable. 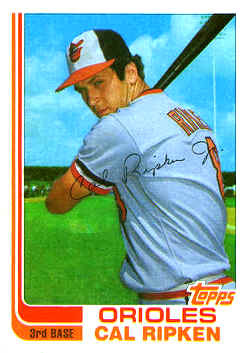 The 1982 Topps Cal Ripken used to book for more than the 1982 Topps Traded Cal Ripken until 1991 or so when people realized that the latter is not only harder to obtain (because you can't pull it from packs) but also more aesthetically pleasing. The 1986 Topps Traded Barry Bonds vs the 1987 Topps Barry Bonds is another example. Those were the two cards I was thinking of, Dock. As well as the Mark McGwire Olympic card. The collectibles store I used to work at had a shelf in back loaded with unopened boxes of packs of, I think, '89 Score or some such, & I used to open the boxes & give kids fistfuls of packs for Halloween when we ran out of candy. I also gave god knows how many unopened boxes of late '80s/early '90s packs of virtually every stripe to the coach at a local small college (same place Shane Reynolds attended) as prizes for kids attending their summer baseball camps. While slightly off topic this is an interesting look at copyright abuse. As I have no expertise on legal issu not sure of it is on the up and up but I guess it could be.